The Venetian museum (tel. 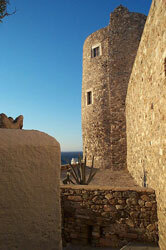 22850 22387) is located in Chora’s Castle, next to the «Trani» (Great) Gate. The museum is housed in the his­torical traditional mansion – stately home of Della Rocca (De la Roche) and Barozzi families. It was erected in 1207, during the same period when Marco Sanoudo constructed the Castle. An aroma of Venetian past fills the rooms of the well – preserved old mansion. • Traditional naxiotic music and dancing nights (violin, lute, bagpipes and toumbaki). • Concert for violin and pia­no. • Guitar recital (international, classical and contemporary repertoire). • Jazz & blues nights. Cyclades): Two – hour seminars, twice a week.